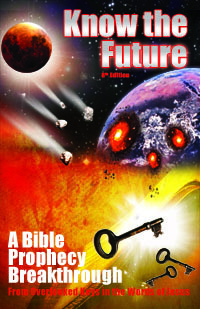 Does Bible prophecy predict an "end of the world?" Unfortunately, yes; but not in the way that most expect or would believe. Civilization won’t end by ice age, global warming, nuclear war, overpopulation, killer virus, supernova, or by any other doomsday scenario accepted by most scientists. Instead, Bible prophecy corroborates a fringe theory proposed by only a few acclaimed scientists. Find out about Nemesis theory and where Revelation describes something just like it bringing a series of global cataclysms to earth. Also why this theory is not so "laughable" as the similar "Planet X" theory. Matthew 24:3, 22 (HCSB) — And as he sat upon the mount of Olives, the disciples came unto him privately, saying, Tell us, when shall these things be? and what shall be the sign of thy coming, and of the end of the world? ... 22 Unless those days were limited, no one would survive. But those days will be limited because of the elect. The book of Revelation has specifics about the end of the world that Jesus spoke of. While it can be pretty scary reading, there is a silver lining to studying it. With the global cataclysms topic so well covered by the Bible, you can safely assume that if a scenario is not mentioned there, then it is because it is simply not in the cards. I'm referring to the many doomsday theories you will encounter on the Internet from both reputable scientists and conspiracy theorist nuts alike. The Bible was in the doomsday forecasting business long before any of them came around and you could say it has a corner on the market with its accurate record. Reputable scientists see many ways that our fragile existence could potentially end, and not just by a nuclear war or the sun burning out billions of years from now. Let's look at a few of the scientific doomsday scenarios proposed by scientists which the Bible also seems to talk about. We'll disregard the scenarios that the Bible says nothing about (like, for example, wandering black holes) under the assumption that only the ones the Bible talks about are going to happen. Everyone is familiar with global warming hysteria today, but did you know that back in the '70s scientists were worried about the opposite: a possible ice age? I remember being fascinated by the theory when I read about it in Science Digest as a boy. You cannot blame the scientists as we were in a troubling cooling trend then, just as now a warming trend is troubling scientists. And once again, cataclysmic climate change is considered a possibility. Thankfully, the Bible does not corroborate either doomsday theory (except that there is an extreme cooling event coming at the 4th trumpet when the sun is blocked as we'll cover below). Viruses, bacterium and other pathogens have proven their potential to devastate humanity. The Black Death plague reduced the world population by 100 million in the 14th century (including one in four Europeans). The 1918 Spanish Flu virus epidemic killed up to an estimated 50 million people worldwide. As depicted in the 1995 movie Outbreak, the Ebola virus has a 50% mortality rate. Genetically engineered bio-weapons could arise that make that look like a case of the sniffles. Although in the Bible Jesus (Lk 21:11) and the 4th seal/horseman of the Apocalypse do mention pestilence or plagues, their impact is limited to at most one fourth of humanity (Rev 6:8), and that number may be spread out over a long period of time that started in recent centuries. Plainly, plagues in the Bible do not come close to bringing TEOTWAWKI. As dramatized in the 2009 Nicholas Cage movie Knowing, if one of the sun's solar flares (ejections of plasma) made a direct hit on the earth, the effect would be devastating. It could collapse the power grid while exposing us to intense radiation, if not fry us immediately. The largest solar flare recorded (the Carrington Event of 1859) electrified telegraph lines to the point that technician were shocked and fires started. The Bible seems to be referring to such a thing when it talks about the sun getting seven times hotter and burning men with heat and fire during the 4th bowl (Rev 16:8). This is part of the controlled wrath of God before Jesus takes over to reign for 1000 years of peace called the Millennium. Obviously, humanity will survive the short-lived super heating from the sun that God has in store for us. Between the evidence that an asteroid could have killed off the dinosaurs and the dramatic impact of Comet Shoemaker-Levy 9 into Jupiter back in 1994, scientists have woken up to the potential of a comet or asteroid hitting the earth. Consequently, programs have been started to search the skies for potential threats of all sizes, not just ELE (extinction level event) rocks of 1km or greater. The Bible is plain about earth receiving not just one impact, but a series including multiple impacts from meteorites on land at the 1st trumpet (Rev 8:7) and a mountain-sized asteroid or comet hitting the ocean at the 2nd trumpet (Rev 8:8) with a major global earthquake preceding (not following) them at the 6th seal (Rev 6:13). Which Bible-Confirmed Cataclysm is Next? Scary, right? It's disturbing how many scientifically accepted cataclysm scenarios seem to be predicted by the Bible. So how do all these cataclysms interrelate? How do we sort through them and make sense of them all? What's next? To sort them out you just have to arrange them on the 21 point timeline of seven seals, seven trumpets, and seven bowls that Revelation provides. The bowls of God's wrath happen at the end, after the Great Tribulation and after the rapture, so they and their 4th bowl sevenfold hot sun are not a concern for faithful believers. With the seals, my research concluded that they are mostly past including "death" from war, famine, beasts and plagues that affect one quarter of the earth starting at the 4th seal. The four horsemen spirits of the apocalypse are already riding and bringing the negative effects described as can be seen throughout history (1: deceptive religions in Christ's name, 2: ideologies taking peace from the earth, 3: an economic stranglehold on the masses by the rich, and 4: the increased deaths, respectively). The 5th seal is unique among the 21 in being constrained to heaven (martyrs' souls under the altar waking up to ask how much longer until they are avenged and being told to go back to rest a little longer). The 6th seal is where the cosmic disturbances start with two eclipses and a great global earthquake. They continue with impacts at the 1st and 2nd trumpet, and conclude at the 4th trumpet with the “nuclear winter” which deep impacts would bring (from all the dust thrown into the atmosphere). I found this sequence confounding. Why does an earthquake happen before impacts do? How do you have a lunar and solar eclipse together? What is the cause and explanation of it all? For the first four seals and all the bowls, the explanation was readily apparent. God was directly sending angels to pour out the seven bowls on earth to judge and repay the wicked. The four horsemen are said to be spirits (no doubt evil ones sent by Satan) as they are not called God's angels as the bowl spirits and many other messengers and spirits appearing in Revelation are constantly identified as. But not for long, as, soon enough, like your friends probably do, a friend of mine forwarded me a new doomsday theory he wanted my opinion of. From that email I learned about a popular fringe doomsday theory not endorsed by respected scientists. The Nibiru cataclysm theory supposes that an outer planet will hit or pass close by earth and bring disasters. Nibiru is the name of 12th planet described in Sumerian clay tablets which supposedly visits earth every 3600 years to bring cataclysms. As time has gone on, it has been attached by conspiracy theorists (like Nancy Lieder) to many other real or hypothetical objects such as Planet X, or the name given in the 19th century to the hypothetical undiscovered planet that was believed to be perturbing the orbits of the outer planets. Similarly, over time it has been attached to multiple doomsday dates. The first I heard of was May, 2003 which was due to come less than a year after I first learned about it. As you could probably guess, December 21, 2012 was the next date attached to it, due to the Mayan Calendar doomsday theory for that date. Despite how hard it is to take seriously a theory centered around a doomsday date, I found the theory intriguing. What if this “Planet X” orbiting our sun was really a dim and hard to detect red or brown dwarf star? This would fulfill the star mention of the 3rd trumpet. Then if that star had enough objects in tow orbiting and accompanying it, perhaps they could reach into our inner solar system where their star could not possibly go without creating total havoc due to its immense gravity. While I did not believe the Nibiru cataclysm theory in its details or its date, considering it allowed me to finally accept the 3rd trumpet Wormwood star as literal along with all the cosmic events surrounding it. I could see Wormwood as the cause behind the entire 6th seal through 4th trumpet cataclysm series, despite it only being seen or blamed for something towards the end of that series. From there over the next couple years, the entire book of Revelation began to open up and come together for me in a very thrilling way. This research became my book Know the Future, which was and is very well received by readers...if they can get past the story recounted above how a “laughable” fringe doomsday theory was instrumental in my breakthroughs. Some readers unfortunately miss that the book is not at all endorsing Planet X, a theory eviscerated by real astronomers. Instead, the book endorses Wormwood prophecy. The problem with this first explanation for Wormwood was in understanding how such an outer planet like star could ever successfully bring trouble to earth. Its orbit would never bring it close to earth, but somehow it would have to bring something smaller close to us. I was unclear on exactly how this part would work. In the latest (2012) edition of my book, I include a better explanation for Wormwood which addresses that problem. I only became aware of it years after I first heard of the Planet X/Nibiru theory. Unlike the Nibiru cataclysm theory that is universally derided by respected scientists, the Nemesis theory is supported by several highly respected scientists today. Yet despite this, you probably have never heard about it. It does not typically appear in “ten ways the earth could be destroyed”-type articles and TV programs. There simply is not enough evidence to prove it—or disprove it, at least not yet. But for Bible readers, the Bible's talk of a “death star” called Wormwood appearing in the future and blamed for trouble on earth may be all the proof they need to accept this scientific theory. Briefly, if our sun is like most stars, it is part of a binary solar system, meaning it has a twin star companion orbiting it far in the distance. A dim red or brown dwarf star that far out and traveling with our solar system would be hard to find and understandably not detected by current search parameters and thresholds. When this star passes through the Oort cloud where comets are kept in “cold storage,” it would disturb their orbits. Some comets would head into our inner solar system. Put another way, Nemesis' passage through the Oort cloud would turn the inner solar system into a shooting gallery. If one of the comets were to approach and pass or glance by earth, it could explain all the effects described by Revelation from the 6th seal through the 4th trumpet. Note, this is not to equate Wormwood with Nemesis or to endorse all the points of the theory as correct or reliable, such as the concept that Nemesis has come before "millions" of years ago. The Bible says nothing about Wormwood coming before, nor does it easily support the idea of earth being millions of years old. Instead, the point of considering Nemesis theory is to explain why the Wormwood star is mentioned with the other trumpet cataclysms and potentially cause them. How exactly this will play out with Wormwood, Revelation does not say. Perhaps a comet sent by Wormwood breaks up near the earth or passing Jupiter, the way and is able to thereby cause the eclipses, earthquakes and impacts described. One thing is for sure, a typical comet is not enough to explain everything Revelation describes since a star is specifically named as involved. Thankfully, while Bible prophecy predicts that we will one day see another star nearby like Nemesis (and name it Wormwood, for bitterness because it will cause devastating cataclysms on earth), life is prophesied to continue here. That said, the aftermath will certainly qualify as “the end of the world as we know it” that many fear one day will happen. Update: My later conclusion is that neither a comet nor a star like Nemesis explains Wormwood. Only a dwarf planet does as this article on Planet 7x touches on . Also this one on Planet 9 . When will Wormwood do all this and should we be watching for it? As Jesus said about the interconnected end time events, no man knows the day or hour. We cannot calculate the arrival of Wormwood effects by any means (especially considering the star itself never approaches or comes near earth, but rather other unknown objects that it passes will). Thus, disregard any dates you hear of as all doomsday dates imagined by man have failed. Also forget about scientists seeing it and warning us. All indications from the description in the 6th seal (when Wormwood's effects begin) are that the population will be blindsided by it. Instead of going into prepared bunkers, shelters or “arks” (as depicted in the 2012 movie), people are seen panicking and running to the caves in the mountains (apparently to avoid being hit by a falling meteorite or drowned by the tsunamis that the sea impacts will cause). If someone reports that they have pictures of Planet X, Nibiru, Nemesis or the latest comet claimed to be on a collision course with earth (like Comet Elenin was), you can safely ignore them. While Jesus did in fact mention the same cataclysms of Wormwood that Revelation describes (Lk 21:11=Rev 6:12, 14, 8:7), he never told us to rely on watching for a wayward star first. Instead, he promised that, just as John the Baptist came to fulfill Malachi's prophecy of Elijah (which even the Scribes expected to happen), likewise Elijah would come again to “restore all things” before the “great and dreadful day of the LORD” (Mal 4:5-6). Since not everyone reads or understands the Bible, and the Bible does not tell us exactly when the “beginning of sorrows” will commence anyway OR exactly where God plans to gather and protect us on earth from it, a prophet must be sent to clue everyone in and lead the way.